[Update: Not likely!] 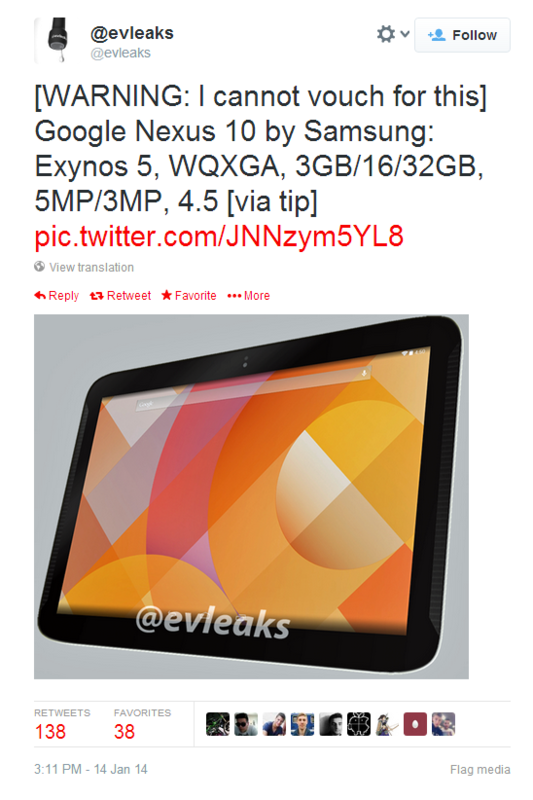 Updated Samsung-Built Nexus 10 Preparing for Imminent Launch? Update: It appears as if this was a hoax. See below for more details. Although the Samsung-manufactured Google Nexus 10 still offers a great value with its class-leading display and relatively speedy processor, it’s hard to argue with the fact that the device is starting to get a little long in the tooth. The device, which was released in the middle of November 2012, is now well over a year old. This is essentially an eternity in the mobile device world, where generational gaps are shrinking faster than we can even keep track (e.g. Samsung’s plethora of marginally different device variants). There has been quite a lot of speculation about the Nexus 10’s successor for an extended period of time. Not only have there been rumors of an “imminent” device launch ever since before November of last year, but we’ve all heard rumors pointing to various different OEMs to produce Google’s next full-size Nexus tablet. Further fuel was added to the fire earlier today, when the 32 GB variant of the Nexus 10 joined its 16 GB sibling, as it was labeled “out of inventory” on the Google Play Store. Up until very recently, the most credible rumors pointed at an Asus-built Nexus 10 successor. But now, thanks to a new leaked image courtesy of leaker extraordinaire @evleaks, we may have to rethink this entirely. Does the prospect of a new Nexus 10 make you salivate? Are you excited about the bump in specifications and the leaked render’s hardware design? Or do you think this is all just a dream? Let us know your thoughts in the comments below! Update: Apparently, @evleaks has retracted the previous leak, calling it a likely hoax.